SCRATCHED – Olivia Webster turns onto the overland trail about 45 kilometres from the start of the Yukon Quest in Whitehorse February 2. EAGLE – Rookie Olivia Webster scratched from the Yukon Quest last Thursday night in Dawson City. Although she was listed as Webster by the race because that’s what her passport says, the rookie uses Shank-Neff as her last name. Shank-Neff is the granddaughter of LeRoy Shank, a former Fairbanks News-Miner pressman and one of the race’s original founders. She’s also married to Hugh Neff, a two-time Quest champion. Shank-Neff, 31, told the News-Miner Friday she didn’t scratch from the race – the Quest forced her hand to stop competing. “When I saw the paper that said ‘scratch,’ they said ‘dogs in heat’ was the reason,” she said over the phone. Shank-Neff had been scheduled to leave Dawson at early last Thursday evening. Before her team started its 150-mile run to Eagle, the first stop across the border, she dropped one of her lead dogs, Mojito, who had been a staple for Neff’s teams in multiple past Quests. Mojito had been suffering from a flank injury, which is frostbite in the dog’s armpit area. The issue often starts as a rash from a harness, and it can persist when temperatures plummet. 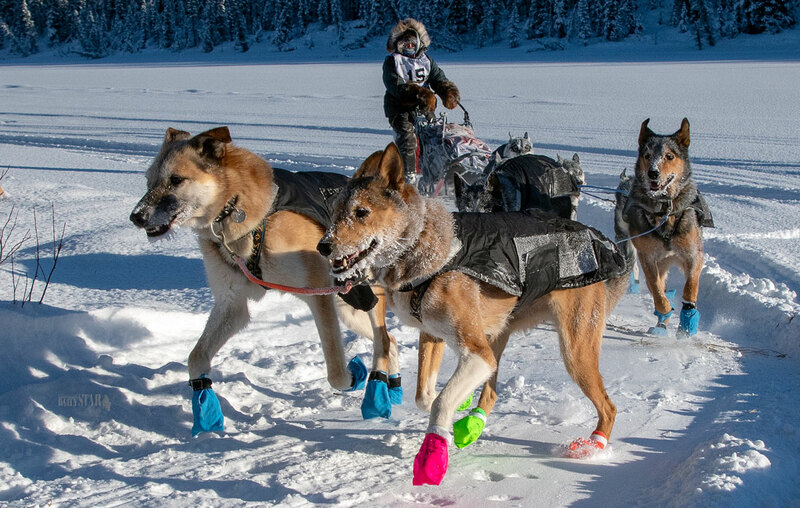 That was the case for much of the first half of the race, when temperatures hung around minus 30 as teams made their way to Dawson from the start line in Whitehorse. Shank-Neff said race officials told her she needed to drop Mojito from her team before leaving for Eagle. “They took my leader away from me,” she said. “They knew he was my only leader. Every year he has the same flank issue. Dr. Nina Hansen, the Quest’s head veterinarian, said Friday in Eagle that she wasn’t sure of the exact circumstances regarding Mojito’s flank issue. However, neither her nor her vet team would typically recommend pulling a dog from the race for that issue, unless the frostbite was becoming severe, she said. “That dog wasn’t forced to be dropped,” Quest race marshal Doug Harris said Friday in Eagle. A veterinarian can’t force a musher to pull a dog from the race. The vet team makes suggestions to the mushers, but the mushers ultimately decide whether they want to keep the dog in their lineup or remove them. If the musher disagrees with the vet team’s recommendation, race judges and Harris can intervene and overrule them. Harris said he wasn’t contacted about Mojito. “It never came to me,” he said. Even without Mojito, Shank-Neff decided to head for Eagle. Soon after she left Dawson, though, two of her female dogs that were in heat started becoming too big of a distraction to the rest of the team, so she decided to return to Dawson to drop those dogs. She said that as she arrived in Dawson, the male dogs started fighting over the two girls in heat. That led to a frenzy — one that triggered a passerby to stop on a snowmachine and offer help. “There kept being a dog fight, a dog fight, a dog fight,” she said. Shank-Neff said that as she worked to break up the fights between her dogs, Quest officials and veterinarians stood by and did nothing. “There’s like race officials around and vets, and they’re just standing there watching me struggle,” she said. Once the dust settled, Shank-Neff said the Quest forced her hand. It’s unclear whether the outside assistance Shank-Neff alluded to when she said Wright told her she received too much help was in fact the passerby who stopped to guide her back to the dog yard. Harris said the protocol for dog fights at checkpoints is race officials normally jump in to help break up the scuffle. He said people helping a musher get through that sort of situation wouldn’t be grounds for a disqualification from the race. “If somebody needs assistance and it’s in the best interest of the dogs to receive that assistance, nobody is going to be penalized for that,” he said. Harris was asked if he was aware of any race judges who were still in Dawson and had conversations about Shank-Neff receiving outside assistance. The race marshal said additional comments should be answered by the musher. Shank-Neff said Friday she was rattled by the whole ordeal, particularly because she had hoped her grandfather would get to see her run a team across the finish line in Fairbanks. “I was just in shock. I’m just in shock,” she said. “Hugh came up and started yelling at everybody, and I was like, ‘Oh my God.’ We just came back to the hotel, and I think at 2 a.m. it finally hit me and I was so upset. The lead dog was pulled because the vet seen a problem. That's their job to make sure no dog is racing that is not up to the task. A female or two in heat is common and yes, dog fights happen and will, but you must know how to deal with it. Who know what would of happened if she didn't scratch. It most likely would have been disastrous and from what I have heard it been a rough trek over Eagle and Rosebud. Hold on a minute! We must understand that the Yukon Quest is two races run simultaneously. There is a group of questers who are looking to win, to get prize money. There is also a group who want to accomplish the goal of completing the race. Shank-Neff seemed to be in that latter group. I wonder, we certainly want to hold prize winners to the highest standard including not getting assistance. But is it necessary to hold those seeking only to complete the race to the same rigour? In instances like this, rather than scratching people from the race, could they disqualify them from prize money, but allow them to continue if they wish? I think that Shank-Neff would have been happy enough with such an option. Sounds like sour grapes to me? I just love it when uninformed experts such as “Disgusted by Quest” prattle on and on with their superior knowledge of, well, everything and yet don’t have the courage to use there own name. So much for their credibility. That seems like inhumane treatment of an animal. Repetitive annual injury and just keep running him, he’ll be fine .